The Union as I remembered it. OSU Campus is still a big part of my life, and so it makes sense that it would creep into the pages of Surreality. Even though it’s been seven years since I last walked the campus as a student, I only live a couple of miles north and often find myself at some of the restaurants and haunts at the periphery. I went scouting for locations for characters and scenes back in 2013 and spent some time at the new Ohio Union plotting out some of the material for Chapter 15. I was a student at Ohio State in the last days of the old Ohio Union. My memories of the new building are of a hole in the ground and most of the south oval being fenced off. Ditto for the library. The new Union is very nice, almost like an indoor mall, and is a lot taller and more open than the old relic I remember. Most of my time hanging out at the old Union was spent in the basement with the lunch group from Men’s Glee. 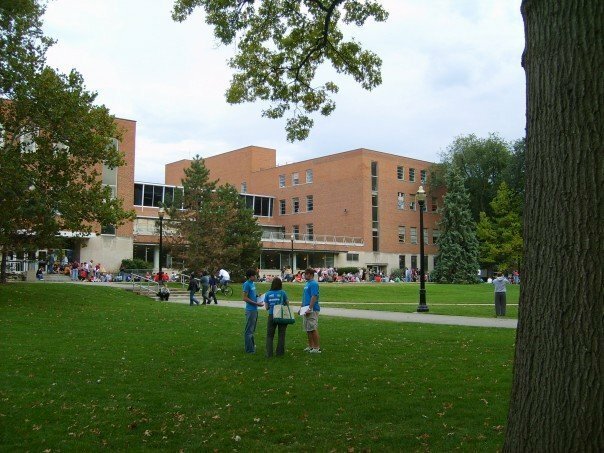 Wiegel Hall is pretty close to the Union, and we would all get food from either Sloopy’s or Marc Pi’s (or even better across the street at actual restaurants on High Street), then hang out with a bunch of tables pushed together. Ostensibly the space was for studying, but no one seemed to enforce any kind of quiet rules, particularly during the day. The campus radio station office was just behind us, though I never saw much activity around it. Maybe thirty years ago, the basement had been a bowling alley, though we only had a couple of old pictures to go off of for that theory. It was gray, drab and boring, but it was ours. When the building was demolished a few years in we moved to the John Glenn center building (next to the Wexner). It was never quite the same (there were offices and we could only get so loud without attracting undesired attention). Now the basement of the new union is a brightly colored culinary space, with a real kitchen. Hanging out at the Union now is confined to the above ground spaces. Campus in particular is constantly changing and it was fun to have my characters bump up against some of those changes, both as way to drive the narrative, but also as an excuse to check out what’s happening. So much of the fun of setting my detective series in Columbus has been finding new areas of town to visit, or seeing how old ones have changed. Surreality, my latest technological mystery, is available now on Amazon, Smashwords, and other online retailers.